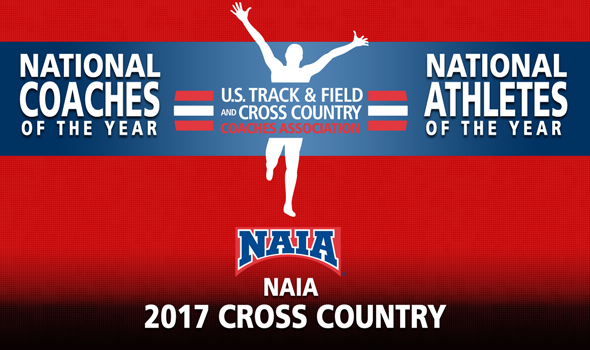 NEW ORLEANS – National Athletes and Coaches of the Year for the 2017 NAIA Cross Country season were announced Tuesday by the U.S. Track & Field and Cross Country Coaches Association (USTFCCCA) following the national championships this past weekend in Vancouver, Washington. Mark Shaw and Aminat Olowora, both from Oklahoma City University, won the Men’s and Women’s Athlete of the Year honors after capturing individual titles. British Columbia swept the team titles so both Coach of the Year honors went to Laurier Primeau. Scroll below for more information on the four award winners. Mark Shaw capped an undefeated season this past weekend at the 2017 NAIA Cross Country Championships when he won the individual title in Vancouver, Washington. Shaw covered the 8K tract in 24:08.7 and finished nearly 10 seconds ahead of runner-up Georffrey Kipchumba of William Carey (Miss.). The Oklahoma City runner also won individual titles at the Southwestern College/NAIA Mid-States Classic, the Chile Pepper Festival and the Missouri Southern Stampede. Aminat Olowora cruised to the individual title this past weekend. Olowora, a senior, covered the 5K course in 16:49.4 and crossed the finish line 31 seconds ahead of runner-up Jessa Perkinson of Southern Oregon. That was the fourth win of the season for Olowora, who also won at the Southwestern College/Mid-States Classic, the Chile Pepper Festival and the Central Oklahoma Land Run. British Columbia broke through in a big way at the 2017 NAIA Cross Country Championships. The Thunderbirds won their first national title this past weekend and dominated the proceedings. UBC notched 41 points, the lowest team score since Life (Ga.) tallied 41 in 1998. Laurier Primeau watched his entire scoring lineup place in the top-20 led by Kieran Lumb and John Gay. Lumb finished third overall in 24:27, while Gay was one spot behind in 24:41. British Columbia is a fixture on top of the podium. This past weekend the Thunderbirds won their fifth national title in the past six years. UBC also won in 2012, 2013, 2014 and 2016. Laurier Primeau’s Thunderbirds had to work for the title, however, as they squeaked by Wayland Baptist (Texas) by a score of 109 to 125. Three athletes earned All-America honors, led by Nicola Symonds, Madelyn Brunt and Enid Au.